Hang in there, all those who are weary of snow. To every thing there is a season. Try not to overlook one season’s gifts by looking ahead to the next. Because in the not too distant future, all we’ll hear is how hot and miserable people are … in drought conditions to boot. 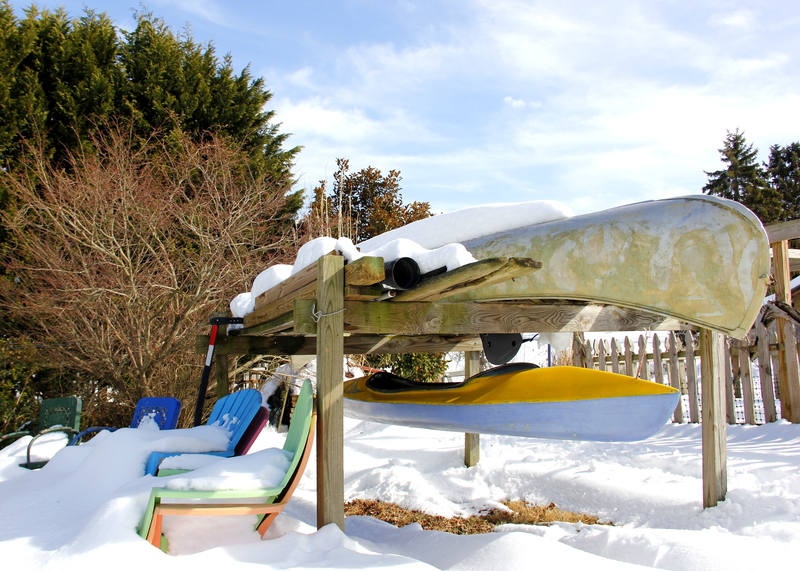 This entry was posted in Photography, Snow, Winter and tagged Bright Colors / White Snow, Canoes in Snow, Live in the Moment, seasonal change. Bookmark the permalink. It was such a bright beautiful day and the summer colors really stood out on that white snow. Thank you! I “see” this scene every day, but your “eye” captured it! Liz, it was fun wandering around the yard with you that day! 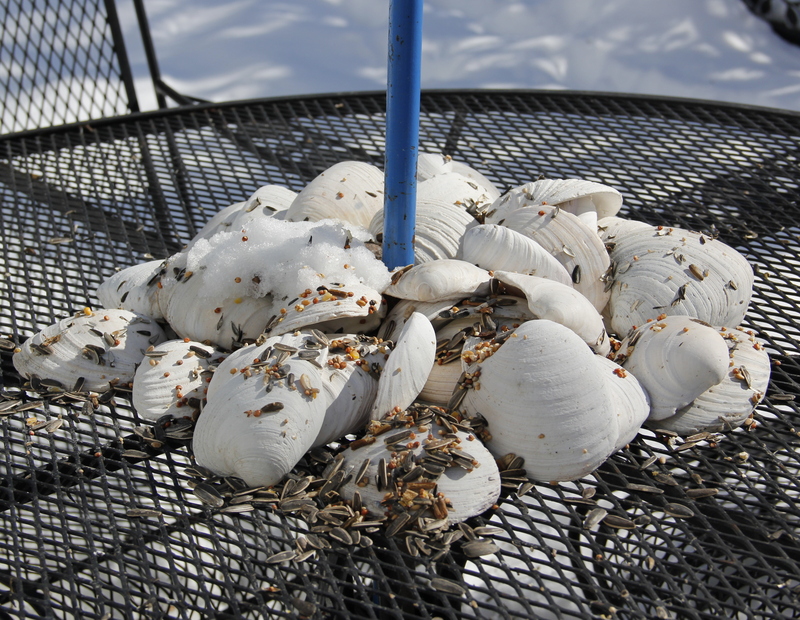 You know, I am not sure what kind of shells they are but your idea is clever (no surprise there – all of your ideas are). You would love my friend Liz’s home / garden / yard. She and her husband Wilson are lovers of birds, have green thumbs, and collect all kinds of neat things to decorate with. I’ll be posting some more photos soon. Pauline, I deliberated over the right word … I’m glad I went with justaposition for the title. Thanks for always offering such encouragement!! To every thing there is not only a season but also a reason. So true, Marcelo … we just don’t always know the reason, do we? Beautiful photos, Laurie. I love the juxtaposition of opposite seasons. You are so right, too. I’m usually first in line to complain about the heat. My complexion belongs in the British Aisles, but my address is California. It’s great for a gardener, not so much for a freckle-face redhead. Yes, you do have the classic beauty of one from across the pond. Glad you enjoyed the photos and if I could send you the melted snow I surely would! Thanks for that. We’re finally making a bit of our own today. And oh my goodness, what a compliment. I’m hardly classic or beautiful but I’m definitely ‘of the British Aisles’. I spend my California summers racing from shady spot to shady spot until the sun goes down. Life through the eye of a camera!! It really helps to more totally take in what is the current reality in all it’s beauty. Even chilly snowy whiteness must be acknowledged!!! Brrrrrrrrrr! We have friends who just built/moved to Aiken, SC, to escape MN. The weather ‘found’ them!!!! We have weather advisories already posted for Thursday……rain and 8″ more snow (6″ yesterday!!!). 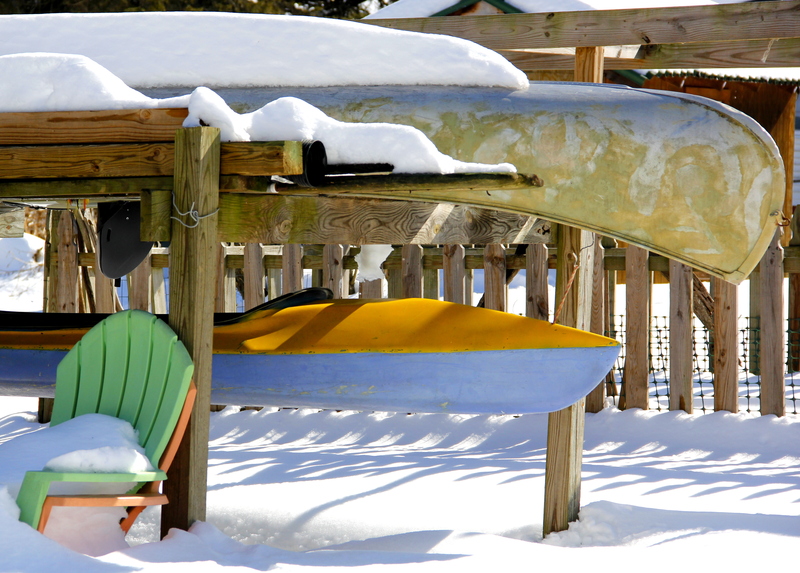 Today….sunny and 40! I’ll definitely get out for a walk today!!!!!!!! Very nice photos! I do love that it’s snow on the summer-used items. And the colors work so well against the snow. I especially like the last shot of the beach chair. It looks like a wave. I’m so glad you noticed that!! I thought it looked like a wave and almost as if done by human hand not nature’s hand. That lovely snow pattern on the chair caught my eye immediately. I’m glad you noticed too. It made me think of a wave first, but then, after reading the caption, maybe anything from the sea: a serpent or steam on top of the water. Really nice colors and photos Laurie 😀 It looks like you are finally starting to have some fun with your new camera. I’m trying not to overlook this seasons gifts but I’m afraid the only gift I got was a back ache, LOL. Have a great evening. I’m sure! I’ve only had to spend a couple days shoveling and I was lucky enough to get into a friend’s hot tub after one of those days. Hang in there, Joe!! Truer words have never been spoken! Love the photos! Thank you so much! I’m glad you like the photos, and the words too. Excellent LB! 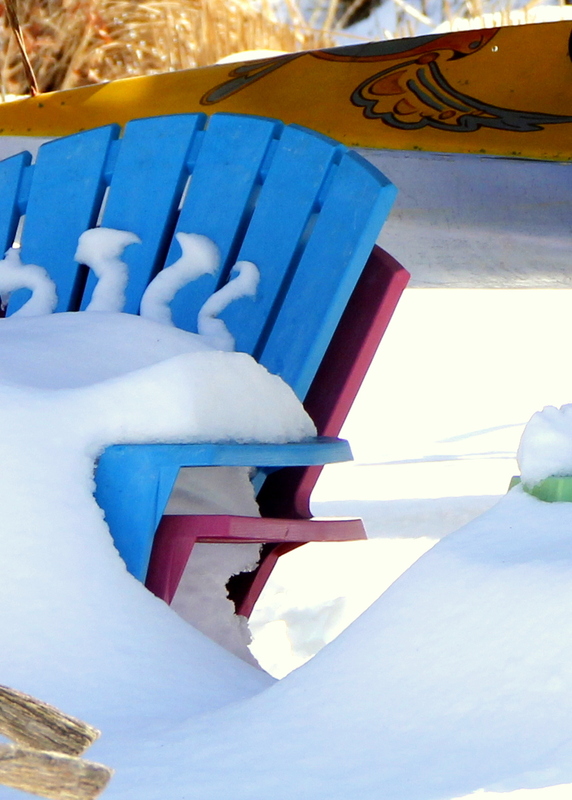 Love the blue chair in the snow, and also love,the reminder about not wishing away winter as we’ll soon be complaining about the hot summer LOL. Thank you Tina … I know I’ve not had to deal with the months of snow that others have had, but I do still try to live with whatever I run into when I leave the house each day. The power of positive thinking. One can always hope. I am crazy about that first photo! And I think you chose the right word too. You forgot something like: “inspiration”, “motivation,” or “encouragement,” in your tags…though “live in the moment” covers those things. You are like joy on tap some days. Thank you. Oh I need to have you help me with tagging … you listed some great words. Even more, you have the best way of making me (and others) feel so good. You have such a fun sense of humor, an open heart and mind, and a love of the world and those living in it. I’m lucky to have found you in the big, wide world of the internet!